I made this card for Pamela's Mom. 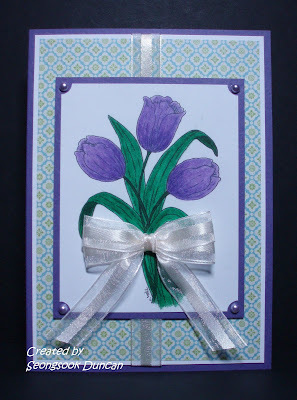 She wanted the 5"x7" sized card and the image in purple color. I used the digital image "Tulip Trio" from Fred, She Said. I colored it with Prisma Colored Pencils. I tied the double ribbon with my Bow Easy. So pretty! I'm sure she will cherish it!